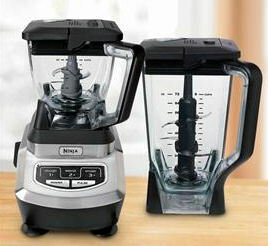 Make your Refreshing Mouthwatering Smoothies with Ninja Kitchen System and Blender! 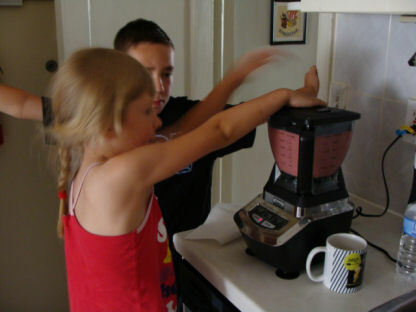 Over the past couple of years my husband I have used a juicer on and off to make delicious fruit and vegetable juices. After drinking them we would always feel invigorated and healthy. Well that is until we had to clean the machine after and saw all of the wasted pulp that the juicer produced. Still we went on occasionally juicing and repeating the process over and over. Years later we would see a multitude of machines being sold through infomercials that promised to use all of the fruits and vegetable while creating delicious and healthy drinks. We heard from some friends and some Internet posts that many of these devices did not live up to their expectations. So needless to say we didn’t order one and kept on juicing. However these moments came less and less since the hassle of cleaning the machine outweighed the benefit of the juice it produced. Last year we saw a commercial for the Ninja Kitchen System and were pretty impressed by its claims. They showed the host creating delicious smoothies from strawberries, carrots, apples, raspberries and many other fruits and vegetables. The Ninja was not just a blender it could also mix dough, make soups, chop ice, blend and mix just about anything. Well that is what they claimed on the television program we were watching. Despite the claims we were reluctant to purchase the Ninja even when it was being sold in most major consumer stores. It wasn’t until my husband read a review about the Ninja Kitchen System in a national consumer product review magazine did we begin to think otherwise. After months of prodding by my husband I finally relented and ordered the Ninja Kitchen System from Brylane Home. For those of you that are not familiar with Brylane Home it is similar to other bed, bath, and home stores except you shop from the convenience of your home or office. They go a step further and expand on many of the types of items that most box stores offer. The selection is great and so is the pricing. Within few days we received our new Ninja Kitchen System from BrylaneHome.com. After opening it, reading the instructions and washing the pitchers and blades we were ready to go. What I liked immediately was the fact that it came with two different sized pitchers. So if you were only making a smoothie for yourself or two people you didn’t have to use a huge pitcher. On the other side if you were hosting a party you could use the large pitcher and have enough smoothies or frozen cocktails for everyone. 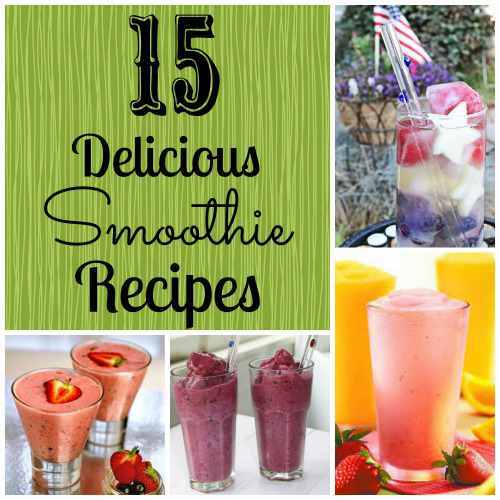 My daughter and I were eager to get our smoothies on so we checked out the included recipe guide to see what we could whip up. 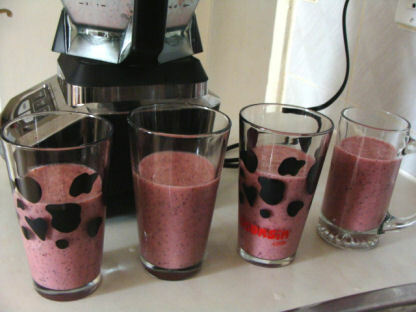 We decided to make a blueberry, banana, strawberry yogurt smoothie. We added about a cup of blueberries, cup of strawberries and two bananas to the Ninja pitcher. (Word of advice put the blade in first before adding the fruit). 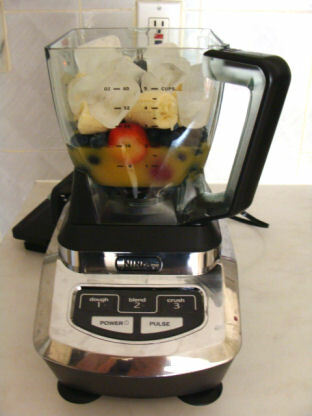 Then we add about 1 cup of low-fat vanilla yogurt 1 1/2 cups of ice and we blended it all up. 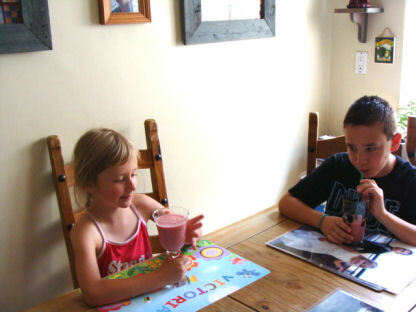 In not time out came a deliciously cold fruit smoothie. The Ninja chopped through the ice and blended all of the ingredients effortlessly. The triple vertical blade system was vastly superior to those found on traditional blenders. I could tell right away that this was going to be our go to kitchen device for the future. I liked the fact that is has only 4 buttons – Pulse, Crush, Blend and Dough. 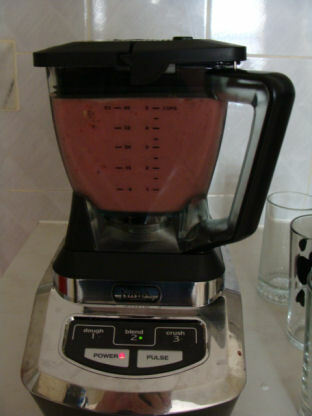 It was also convenient that this machine would stop by itself when the smoothie is perfectly done. And best of all it was a snap to clean. All we had to do was rinse it out with warm water and mild soap without even putting it into a dishwasher. The small pitcher is good for about 4-5 cups or as you can see on the picture above I evenly divided the mixture into 4 Tall glasses. The large pitcher is good for 10-12 cups. I look forward to when my mother visits so she can try out the dough mixing attachment for when she makes her pastries and crepes. The Ninja Kitchen System has permanent home on our counter-top and in bringing healthy fruit and vegetable juices to my family and I. 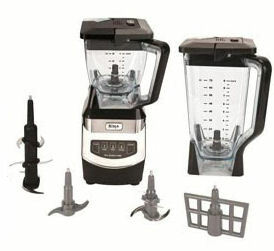 Be sure to check out the Ninja Kitchen System and other great items at BrylaneHome.com. Disclosure: I was not financially compensated for this post. I received a free sample of the product for review purposes. The opinions are my own, based on my personal experience with the product. I will drink like this one. Seriously, i envy those kids drinking like that. Hoping i get the right steps. Juicers with two different sized pitchers. Great, because you don’t need to make a resizement in making juices.